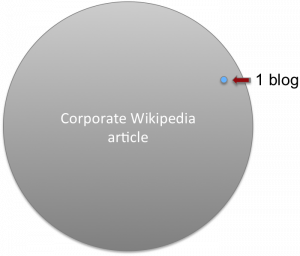 The biggest reason marketing and Wikipedia’s editorial community often find the relationship contentious is because companies haven’t invested the intellectual capital in meeting Wikipedia’s content needs. We’ve made a science out of the most viral tweet, the optimal Facebook post, most compelling blog and optimized landing page, but haven’t invested in ethical Wikipedia engagement. But investing in doing Wikipedia properly means convincing your boss it’s important. So here’s five reasons Wikipedia is more important than… other stuff. Compiling data from the Pew Internet & American Life Project shows that Wikipedia has more educated, adult, online readers than Facebook or Twitter. Wikipedia’s readers have more PhDs than Facebook and Twitter combined and only a few less readers than Facebook has members. Public relations raises awareness for companies and products, but afterwards media, customers, potential employees, partners and others need a neutral and independent source for the research phase of the lifecycle. Wikipedia isn’t at the “awareness” phase, but is at the interest or research of a partnership. Readers come with purpose and they’re looking for information on your company, brand, heritage, reputation, leadership, products and culture. Why wouldn’t we want to help Wikipedia inform readers about us? To get the same traffic as their Wikipedia article, this example company would have to write three blogs a day for a year. If each tweet was read by one percent of their followers, it would take about 1,000 tweets to reach the same number of eye-balls. 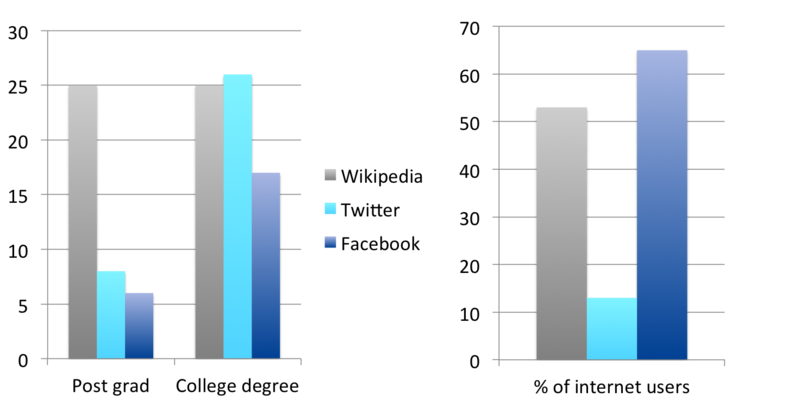 The chart on the right shows the readership of a single blog post versus the annual readership of a Wikipedia article for a Fortune 500 company. Try the experiment yourself by looking at the average readership of your blog and the views of corresponding Wikipedia articles. The money invested in tweeting is gone in a flash, but a Wikipedia article could outlast the very popularity of Facebook or Twitter. Companies that want to invest in a durable product will find Wikipedia a compelling opportunity. Wikipedia isn’t a place for sensational headlines, thought-leadership, news-jacking or corny hooks. Wikipedia is a place for serious, encyclopedic information to inform readers on a subject. Technical companies, B2B companies and those with serious products have a hard time finding visuals for pintinterest or showing personality for Twitter.